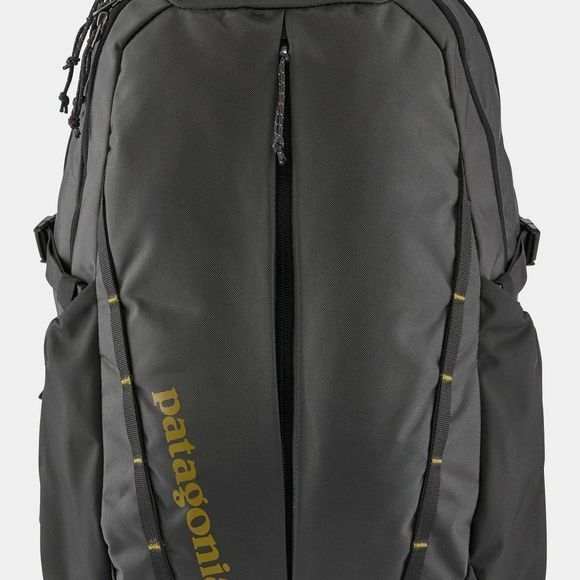 The Refugio 28L Rucksack from Patagonia has two main compartments, one external stash pocket, and a clean, uncomplicated design to keep you organized in town or on the trail. The main compartment holds much of the load and features a lined tablet sleeve for quick access to your hand-held electronics, and a dedicated computer sleeve that accommodates most 15" laptops (the same sleeve also accepts a hydration reservoir when your feet leave the cement). The second, zippered pocket holds your smaller supplies and keeps electronics, cords and accessories organized. On the exterior, a front stash pocket is just right for plane tickets or other small items you want close at hand. Stretch-woven side pockets accommodate a full range of water-bottle shapes and sizes. Airflow mesh on the shoulder straps and back panel prevents overheating, while compression straps stabilize contents. Made from 630-denier 100% Nylon (50% recycled/50% high-tenacity) plain weave. The Lining is 200-denier 100% recycled polyester. Both fabrics have a polyurethane Coating and a DWR (durable water repellent) finish.